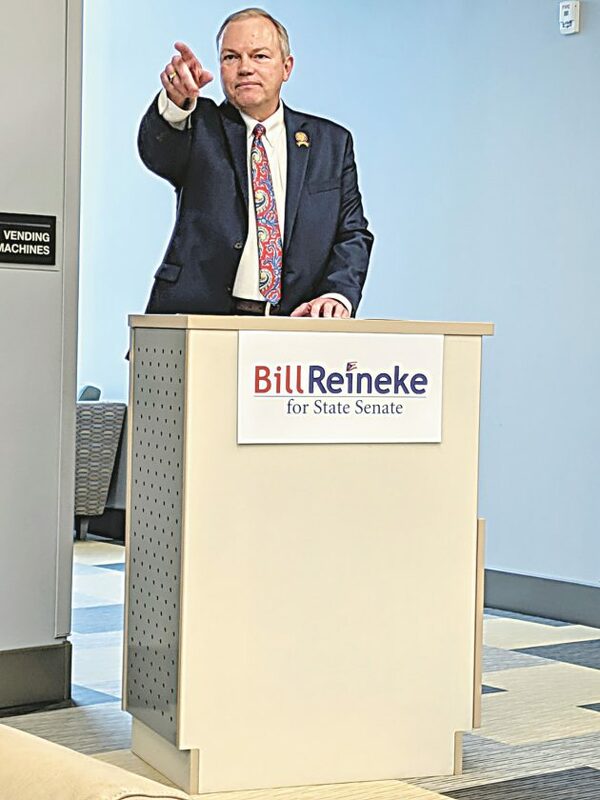 PHOTO BY VICKI JOHNSON Bill Reineke points out the many family members who joined him Monday morning at the Fostoria Learning Center as he announced his candidacy for Ohio Senate. He made the announcement from the Fostoria Learning Center, a community center project Reineke helped to support as a state representative. “This is big for me personally,” Reineke said during his announcement. Reineke said he’s looking forward to extending his work in Seneca and Sandusky counties into a larger area. He now serves the Ohio House 88th district. The 26th Senate district is comprised of Sandusky, Seneca, Wyandot, Crawford, Morrow, Marion and Union counties. The current senator, David Burke, R-Marysville, has served the district since 2011. His term is ending because of term limits. “It’s a bigger district, but the challenges and opportunities are the same,” Reineke said. As a state senator, Reineke said he would continue to work on issues in a larger area of the state. “We’ve accomplished so much in Seneca and Sandusky counties,” he said. The Learning Center itself was a project designed to create space for people to continue their educations. While jobs have been lost, he said the center is offering people an opportunity to train for new employment. He said the Learning Center has become a model for other communities building similar centers. Issues he would advocate for as a senator are similar to what he’s doing in the House, he said. Reineke said he has focused on workforce development and improving Ohio’s business climate. As a business partner in Reineke Family Dealerships, a 10-dealership network in Fostoria, Tiffin, Upper Sandusky, Lima, Findlay, North Baltimore and Toledo, which employs more than 450 people, Reineke said his platform always has been to use his knowledge as a businessman to create a climate friendly to businesses. “Because of this, I’m able to see the bigger picture on how to help our region and state,” he said. Reineke said he has worked toward making government smaller and more efficient and cutting taxes by millions of dollars. He said has supported training for law enforcement to protect communities and battle the opioid problems, and has supported providing additional money for education. He said students are leaving high school in need of remedial education. Other points of his campaign include a 100% pro-life voting record and strong support of the Second Amendment. He was joined for the announcement by his 91-year-old father, Bill Reineke Sr., and many of his nine siblings as well as extended family and community supporters. He thanked his family for providing a stable upbringing where he learned to work hard in the family business. Reineke is a graduate of Morehead State University, where he earned a bachelor’s degree in business administration. He is a past chairman of the Ohio Automobile Dealers Association and is the past Ohio director for the National Automobile Dealers Association. He has served as the chairman of Seneca County Chamber of Commerce and is a member of Tiffin Rotary Club, where he served as president. In 2010, he received the Outstanding Citizen Award from the chamber and an Outstanding Business Award from Tiffin-Seneca Economic Partnership. After the morning session in Fostoria, Reineke continued his announcements Monday in Tiffin, Marion and Marysville.